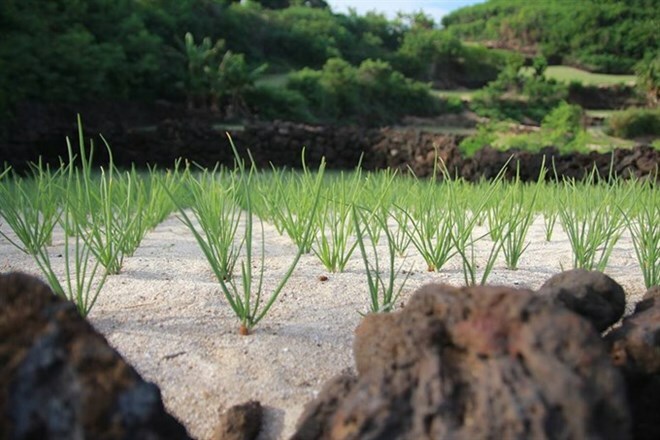 Quang Ngai (VNA) - The Island district of Ly Son in the central province will start constructing its first organic garlic farm, with a total investment of 4 billion VND (177,000 USD). Director of the Ly Son Island Company Nguyen Van Dinh told Vietnam News that the farm will be built on 2,500sq.m with updated high-tech farming equipment. He said the farm will provide 700kg tall shoots of garlic each day after a two-month growth period. It will also employ 50 local residents with stable income. Dinh said the farm will provide technical consultancy for local farmers in the district to develop organic garlic farms with high productivity and price. He said the farm can increase its garlic area by growing on ready-made soil on high-rise buildings. It’s also the first investment in high-tech farm project in the island, which is 30km off the coast of the central province. The farm plans to offer a tour for 20,000 VND (nearly 1 USD) per visitor. Last year, the National Office of Intellectual Property of Vietnam, under the Ministry of Science and Technology, recognised the brand ownership for the products of Ly Son Island including garlic, onion, seafood, garlic wine, dried seafood and seaweed. It’s also the first made-in-Ly Son seafood and aquaculture products to have their own brand nationwide. In 2015, 40 tonnes of Ly Son garlic were exported to Thailand. The company, in cooperation with the island district and the island’s farmers association, plans to produce organic black garlic for export to Japan, the US and Asian countries, and produce garlic oil. Ly Son garlic has a distinctive flavour and is in high demand at home and abroad. However, this year only 250ha of garlic and onion were planted due to serious drought on the island.